As the App Store for iOS approaches its 10 billionth download, Apple has launched a countdown clock, and a new promotion that will give the person who downloads the 10 billionth application a $10,000 gift card. Apple began promoting the countdown on the front page of its website on Friday. "The App Store is about to hit 10 billion downloads," it reads. "The countdown has started. And someone's going to win." Apple has less than 250 million downloads to go before it reaches the 10 billion milestone. The counter shows new applications being downloaded from the App Store at a rate of about a thousand for every five seconds. "As of today, nearly 10 billion apps have been downloaded from the App Store worldwide," the site reads. "Which is almost as amazing as the apps themselves. So we want to say thanks." 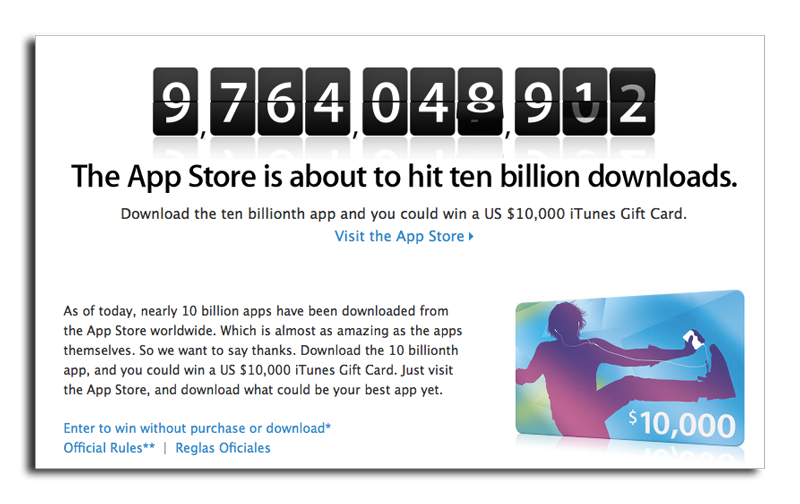 The person who downloads the 10 billionth application will win an iTunes gift card valued at $10,000 U.S. "Just visit the App Store, and download what could be your best app yet." The App Store is a digital download destination that has been crucial to the success of Apple's iPhone. Last year year, it extended to the iPad, and this month a spin-off of it, dubbed the Mac App Store, became available for Mac OS X 10.6 Snow Leopard. The popularity of the App Store has grown at an exponential rate. Just a year ago, Apple revealed that total App Store downloads had topped 3 billion. That means nearly 7 billion applications were downloaded in the last year alone. For comparison, in its first year of availability, there were more than 1.5 billion downloads from the App Store for the iPhone and iPod touch. Apple has even tried to trademark the term "App Store," through a filing made just after the service opened in July 2008. This week, Apple's rival to the north, Microsoft, filed an objection to Apple's request, calling the term too generic to be fairly registered.